No doubt about it, little brothers can be monsters. When sixth grader Jake Doolittle finds a baby on the doorstep and his mother decides to keep it, those words are more than just an expression. Instead, they perfectly describe the way his new little brother, LD, sprouts pointy ears, thick fur, and fangs in moonlight. Not only is LD a monster. . . . other monsters have plans for him. But together with his friend "Weird Lily" Carker, Jake isn't about to let anything happen to the baby. The little guy is still his brother, even if it turns out that LD may be the key to saving the world -- or destroying it. Soon Jake and Lily are on a perilous quest through Always October, a world populated with monsters ranging from the venomous to the ridiculous. 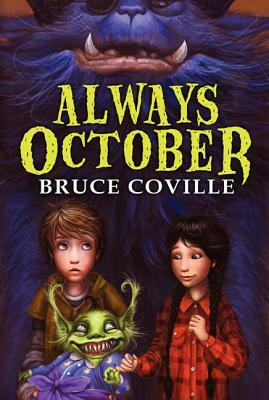 Master of comic suspense Bruce Coville presents a tale of ominous dangers and hairbreadth escapes, of the conflict between forces of dark and light, and of the lengths to which one boy will go to save his brother -- monster or not.